Brighde's Vegan Kitchen | Just a girl who loves to spread the joy of a vegan lifestyle. For the second year now, I have been lucky enough to have a full medical provided by the medical insurance that I have as part of my job. The small amount of money we get to actually go quite far in Asia and as well as having all the basics done, I always like to ask to have a few extras done, especially those nutrients that a vegan can be lacking. I headed on over to Bumrungrad Hospital in Bangkok (because I just moved back here… YAY) early in the morning with an empty belly to get all my numbers done. After lots of poking and blood work, I went back to the doctor and listened to the results. Here is our interaction, because I think it illustrates just how much many seeds that can be planted in such a short exchange. Doctor: So your results are in. Your blood pressure is a little bit low but not low enough to require any treatment. Your BMI is excellent, calcium is fine, iron is a tiny bit low, but not enough to require any work to be done. B12 is good and your cholesterol is excellent. Brighde: Great. Do you know why my numbers are so good? Brighde: Well, I have a family history of osteoporosis and high cholesterol, so I am quite sure the numbers being good is because I am vegan. Do you know what that is? Brighde: Someone who eats only plants, like jeh. No meat, cheese, eggs, dairy, fish etc. You know, you should recommend eating this way to your patients who have heart disease. I think it would really help them. 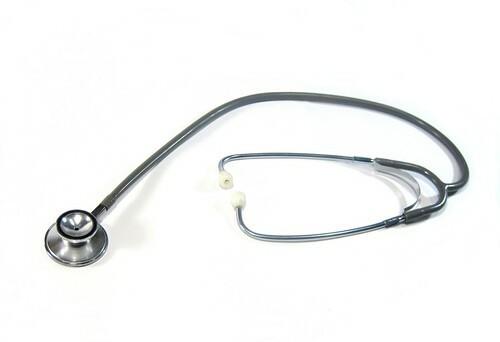 Doctor: But, I think that it is really difficult. Even I cannot do that. Brighde: Well, I agree with you, that at first it is difficult while you learn to eat a different way, but I want to know. What is worse? Having your chest cut open or eating vegetables? Doctor: Hmm… Well, what about burgers? I would miss burgers. Brighde: I can teach you how to make burgers that will be really tasty. Brighde: Can I have a piece of paper? I scrawled down the names of some important films or books that she might like to peruse in her own time. After our pleasantries, I left the office with a skip in my step knowing that I had planted some really good seeds in that interaction. Today, I need to go an see her again to pick up the report, and I will be offering her a USB stick with my favourite health related movies which of course, she might watch. 1. Why don’t doctors know more about the health benefits of eating a vegan diet? Well, I think part of this is just the few hours that doctors spend on nutrition in medical school? 2. Why are regular doctors prescribing such moderate and ineffective recommendations to heart disease patients which are rarely successful? I think an answer to this, is that they feel it is impossible to make such ‘drastic’ changes to THEIR lifestyle, surely their patients could not do it either. 3. Wouldn’t it be fantastic if hospitals had health coaches in them, that were covered by insurance that would give the sick people all the help they needed to live a plant-based lifestyle, eg cooking lessons, supermarket trips, counselling etc? Bumrungrad does have a ‘nutrition program and weight management area’ which I must find out more about, but I bet it is not what I have just described. It was my second visit to Nepal as a vegan, for Seb, his third so we feel like we have a good lay of the land now and would love to give you some tips in case you are planning a trip to this beautiful part of the world. First of all, a little about our context. We were tea house trekking which means you stay at a little, usually very basic guesthouse every night and along the way there will be other guesthouses that you can have lunch in and snacks. While nearly everyone has porters and guides to help them carrying their belongings. We didn’t. We carried our own bags. We certainly did not prepare our foods or were self -sufficient. It is also worth saying, that we went in winter time which is pretty cold weather. This means that we observed very few vegetables being grown or available. The situation might be different at other parts of the year but at the higher reaches of the trek they told us that all vegetables are imported by plane from Kathmandu and that food had to be brought to the villages on the back of the yaks or the porters at considerable expense. This explains the high prices of foods compared with those in the valley or in Kathmandu. It is also worth mentioning that in my previous visit to Nepal, I spoke with someone who worked for the World Food Program in Nepal. She told me that the was a lot of malnourishment in the mountainous areas of Nepal to the extent a many people needed vitamin supplementation. 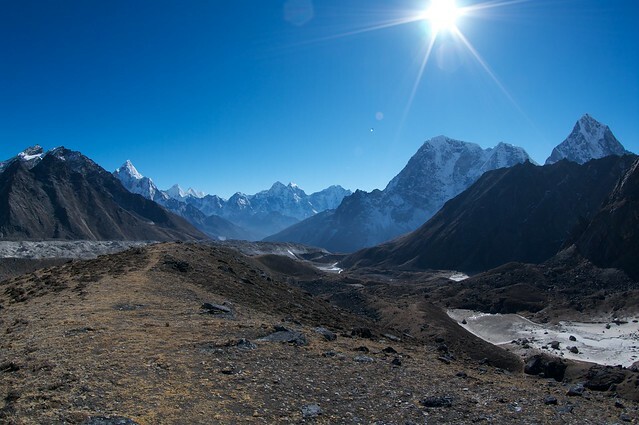 At the time, this surprised me, but on my second visit, I could certainly see how this is the case even in the relatively wealthy valley of the Khumbu. There are few vegetables, hardly any fruit and to be honest, not a lot of protein either especially for those who do not need eggs. So what kind of food is available while trekking in the teahouses? Dal baht: This is local stable in the mountains and I really like this. 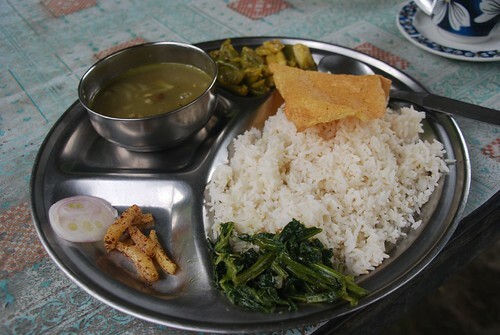 It will compose of a big plate of white rice, a bowl of thin dal broth and a vegetable curry. Usually the higher you get up the mountain, the vegetables will be more like just potato so it not especially nutritious apart from just calories. 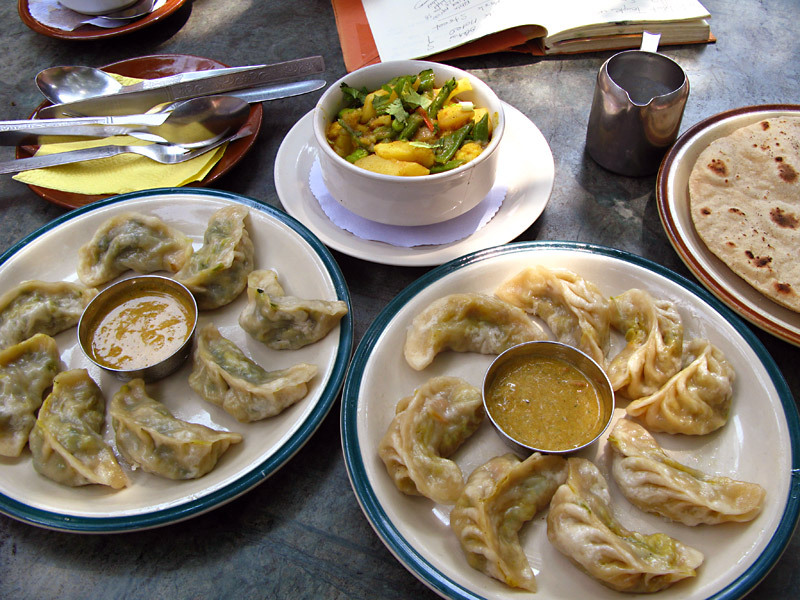 Momos. These a small steamed dumplings also made with refined flour and some vegetables inside. Pasta. One of my favorites. There might be a few different versions. The best is one served with tomato sauce which seemed to just be a canned tomato sauce or soup. Popcorn. A fantastic snack to have when you arrive at the trek and waiting for dinner. Plates of boiled vegetables are available although they are usually not very flavorful and fun to eat. They are also expensive. Potatoes… Lots of them. Rostis, french fries and hash browns. All those not vegan are easily made vegan (Can I have the rosti minus the egg and the cheese?). Soups. Lots of these that are vegan, yet not especially healthy. Oatmeal without milk. One of the better choices. Usually you will need to add sugar and sometimes there will be some apple too. Also a the lodges there are lots of vegan processed foods which can work out well. Oreo cookies, Pringles, candies. As you see, there are plenty of foods available that are high in calories which is what you need when you are expending so many calories as you do on a a trek in cold conditions however, they are not necessarily the most healthy and I would suggest that working so hard on a diet that is low in nutrition over a long period of time without those incredibly important phytonutrients that should be making up a significant part of our plate each meal and I do not like missing out on my fruit and vegetables over such a long period of time that a trek can be. Some people can go trekking for weeks a a time. I contracted a cold towards the end of the trek, and I have a sneaky feeling it was because my body was not as healthy as it normally is. So, here are some tips to make your trek healthier and more delicious. So, the food available at the teahouses are not especially exciting as a vegan so you will want to bring something to make things a bit more exciting. Cookies are of course fantastic and we went crazy over a pack of Mcvities Ginger Nuts by Day 8 of the trek. Dark chocolate is a fantastic snack to have on the trek. A plastic jar of peanut butter is tasty and delicious. Seb thought sways of chocolate dipped in peanut butter was pretty awesome and I have to say I do agree. Ordering chapattis and spreading them with peanut butter and rolling them up and putting them in a zip lock is a good snack to have. Dried seaweed snacks are also great to have in your bag. Although not calorie dense, they are a fantastic (and light) source of vitamins and minerals. 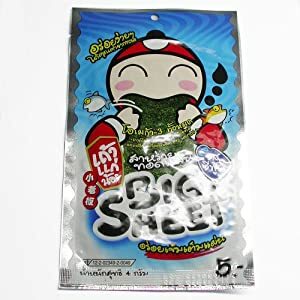 In Asia the are a huge array of seaweed snacks available. I brought this one. You can also bring dried vegetables on the trek too. I stocked up on some from Thailand called Betterday but I am sure which ever country you are from there will be dried vegetable snacks that you can stock up on. Another thing you might like to bring is soy milk powder. Most of the milk available on the mountain is dried cows milk so asking the guesthouse to make up some powdered soy milk should not be a problem and this will open up a few more options on the trek. Granola bars are also good things to take. Although carbohydrates and sugar is not really something that is difficult to find in the mountains, if they are made from whole grains, then it would be a good source of fibre and nutrients something that is lacking up there. Green powders would be a fantastic thing to include in your backpack. Normally, you would not put even powders in water as it would not taste particularly nice. I put my green powders in a smoothie where the taste would be disguised but smoothies are not really an option on the mountain. I would probably just add a spoon to the last dregs of my water bottle and drink it down to get some nutrition in to my body. The last thing I would probably like to bring is some sort of seasoning. Gomashio or a small bag of nutritional yeast will be light, but some sprinkled on your food will give some good flavour and of course great vitamins and minerals. Negotiating with staff at the guesthouses is very easy indeed. They are usually very good English speakers and understand the concept of vegetarianism, indeed, they eat mainly vegetarian food. Vegan is not a term they are familiar with, but it is easy to ask questions like “does this have milk, eggs, cheese?” Or “can go make this without cheese?” For example. So that is all I have got. I hope this gives you some ideas about how you make you trek more nutritious. If you have any more ideas to make Nepal treks a bit more healthy, please leave them in the comments below.